The Škrubi house was built in the 19th century. A single-storey building with a cellar is covered by a double-pitched roof with hip ends. An extension attached to the corner is a two-storey building covered by a double-pitched roof and with a timber balcony. Both buildings are covered with wood shingles. A sawmill, located across the road, was partially destroyed during the landslide in 1964. The Municipality of Crna na Koroskem is trying hard to relocate here a sawmill and a water mill (Rozanceva zaga) presently located in the center of Crna. 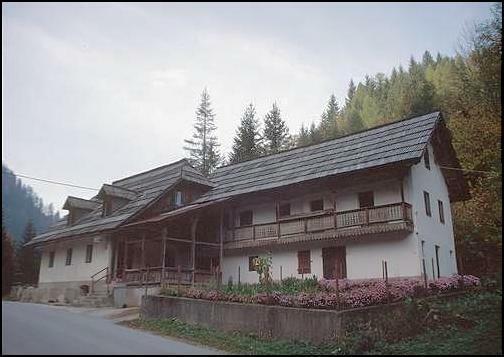 Škrubi's house is registered in the Central Register of Cultural Heritage, maintained by the Ministry of Culture, Cultural Heritage Office of the Republic of Slovenia, with the heritage reference number 15445.